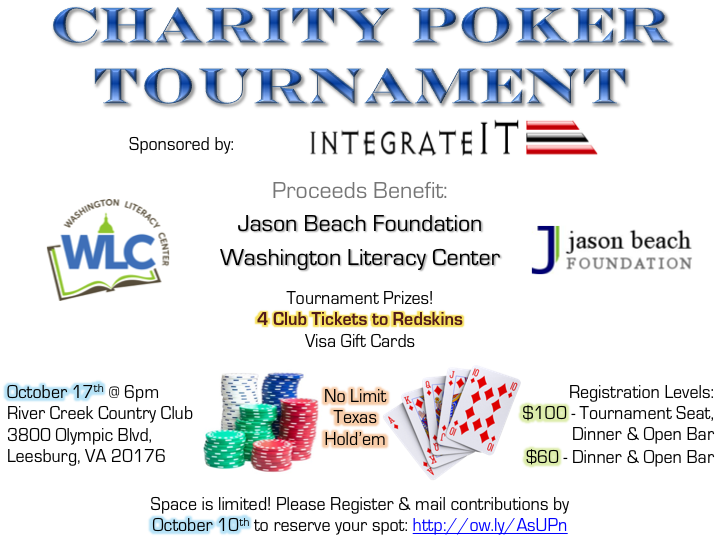 We're excited to be holding a Charity Poker Tournament on Friday October 17th with proceeds to benefit two great organizations, the Jason Beach Foundation and the Washington Literacy Center. Registration is now open and will run until October 10th. The event will open for dinner and open bar at 6pm, with tournament play to follow. Visa gift cards will also be awarded to runners up. Space is limited, and tournament seats will be considered reserved as contributions are received. We look forward to seeing you at the tournament!